This specific recipe was probably one of the strangest combinations of flavors I have ever seen, but also one of the most delicious! I stumbled across it while browsing Tablespoon and had to make it. I usually change recipes a bit to fit my desires, but this one was too interesting to change. The bananas in this recipe are the foundation of the sweet, smooth topping and the green chiles add an after-kick to spice things up. These Caribbean flavors are a perfect pairing of sweet and spicy. Preheat the oven to 425F. Cook the yellow rice according to the package directions. Coat the pork chops with garlic powder, cayenne pepper, paprika, salt and pepper. 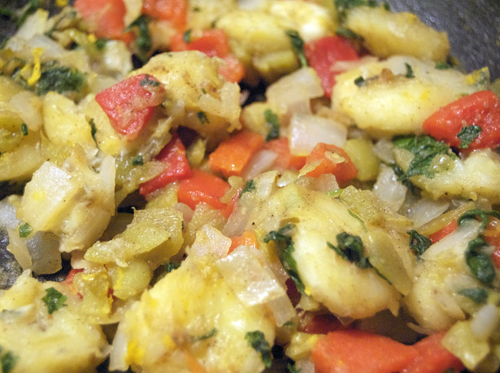 Place on a baking sheet and bake until cooked through (about 15-20 minutes). Heat the peas in the microwave until warm (about 1 minute) and stir into the rice. Set aside and keep warm. Heat the olive oil in a large skillet, add the onions and cilantro and sauté until they begin to soften (about 3 minutes). Add all of the remaining ingredients, bring to a boil, then turn to low and let simmer until thickened (about 5 minutes), stirring periodically. 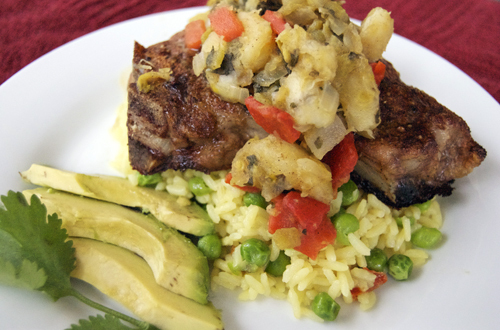 To serve, place rice and peas on plate, cover with a pork chop and top with the banana mixture. Serve with avocado slices if desired. These look great. The banana must give it a wonderful sweet and smooth flavour! Love pork chops. Great recipe. The pork chop looks great. This sounds great- love the pork banana flavor combo. Kinda cuban-esqe! I think this sounds delicious! The flavor combos might not be a typical meal, but YUM! I’d love it! What a lovely meal! Looks wonderful. I love this recipe. Full of flavour. I am so interested in the banana topping. I am sure I’d like that. Mmmm I LOVE anything Caribbean and this looks soo good 🙂 Definitely saving this recipe to try! This sounds awesome. Funny, I was the same way when I was a kid. I hated almost all veggies. Now I’m trying all kinds of different combinations and coming up with some interesting recipes. Mostly to do with barbecue and spice rubs. The bananas in this sound very tempting. I love the Caribbean dishes. I’ll be trying this one out for sure! 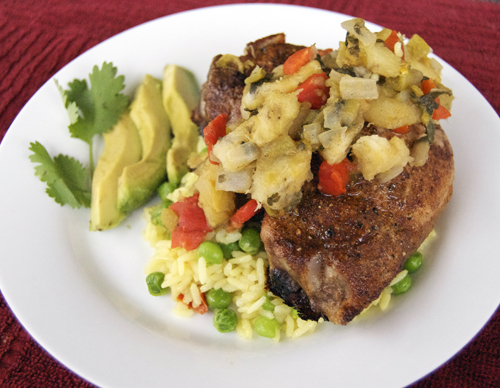 what a great way to serve pork chops! I love the presentation! Congratulations on Top9! It’s well deserved! This looks good. An interesting blend of the sweet and savory with the use of bannana. Really creative.